Perhaps no one should be surprised by the final score as Savannah State has a history of giving up points like there was no tomorrow. But when one looks at the scoreboard, it’s still a little jarring. Oregon broke its program record for points in a 128-59 win over the Tigers Saturday afternoon. The previous record was 121 points. With the win, the Ducks improved to 7-2 on the season and the win was their 30th straight home win. Savannah State dropped to 2-8. A lot of Ducks had big games and it was Tyler Dorsey who had the biggest game by leading Oregon with a career-high 29 points on 12-of-16 shooting from the field. 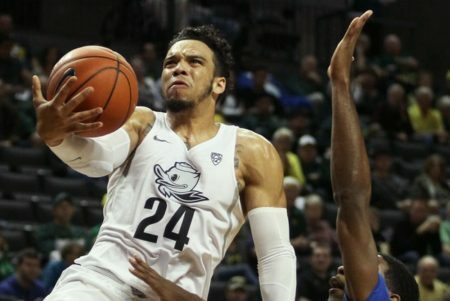 Dillon Brooks managed 22 points and freshman Keith Smith added 15. Savannah State is on pace to break the record for three-pointers attempted and this game kept up that pace as they put up 50 shots from long range. Oregon’s athleticism made it difficult for the Tigers to find open threes and the Ducks forced them to shoot longer from the three-point line than Savannah State is used to. The Tigers just 11 of those 50 long shots. Oregon wasn’t shy from putting the ball up from beyond the arc, shooting 12-of-35 for 34 percent. The Ducks torched the Tigers from inside as they took full advantage of their size. Overall, the Ducks shot 60 percent from the field for the game on 54-of-90 shooting. The Ducks had seven players in double figures with Chris Boucher and Roman Sorkin each scoring 12, Dylan Ennis and Kavel Bigby-Williams each added 11. Bigby-Williams also led the team with 11 rebounds. Oregon dominated the smaller Tiger team on the bounds, grabbing a 67-29 advantage. Dorsey’s big day started early as the sophomore guard scored the first seven points for the Ducks. Savannah State’s style of playing little defense didn’t help it much and Oregon took full advantage. Dorsey scored 20 points in the first half and the Ducks took a 58-35 halftime lead. Oregon proved to be the most athletic team the Tigers have faced this season and they didn’t have much of an answer for the Ducks’ inside presence or their athleticism. Oregon managed 42 points in the paint in the first half alone. When Brooks was in the game, he could do most anything he wanted from all parts of the floor. He scored 12 first half points and the Ducks turned many offensive rebounds into easy points. Oregon outrebounded Savannah State 31-16 in the first half alone and the second half proved to be much of the same. The Ducks will now have over a week to prepare for Alabama, who comes into Eugene next Sunday, Dec. 11. The Crimson Tide are 4-3 and are coming off a 77-68 loss at Texas Dec. 2. They too will have over a week of preparation for the Ducks. The two teams faced each other last season with Oregon coming away with a 72-68 road win. The post Records Fly in Ducks 128-59 win appeared first on DuckNews.com.